Balaklava bay is a narrow and deep bay, hidden by mountains and completely invisible from the sea. It is closed from waves and winds from all directions, it never storms. From the point of view of its geographical features, it is the best place for mooring ships. The cozy beach on the edge of the embankment is always filled with small and large yachts. The underwater landscape of Balaklava bay is very picturesque and is very popular and a favorite destination for divers from all over the world. Surrounded by mountains since ancient times attracted Balaklava bay Taurus and later the Greeks as a convenient place to settle. On the banks of the picturesque bay Greeks founded a settlement, which has served as the beginning of modern Balaklava (in Turkish means "fish nest"). The first building of the city was the Church "the temple of the Twelve Apostles." But in 1794 in its place a new church "St. Nicholas" was built, which has been preserved to this day. But the main attraction is the Balaklava Cembalo Fortress, which was founded by the Genoese. Gradually Balaklava became transformed into a resort town, which over time has attracted many celebrities of literature and art. So, in Balaklava visited AS Pushkin, LN Tolstoy, Gorky, MA, MY Lermontov, Chekhov AP and many other writers and poets. And stories about the city Kuprin AI what have become classics of Russian literature. Also in the vicinity of Balaklava revived viticulture. The very first wine bar was created by Prince Golitsyn. After World War II it has been introduced technology to accelerate the production of sparkling wines developed by the best specialists of Massandra. Now fans can enjoy sparkling wine sparkling wines of Russia: "Champagne of Russia," "Red sparkling", "Soviet Champagne", "Muscat sparkling". 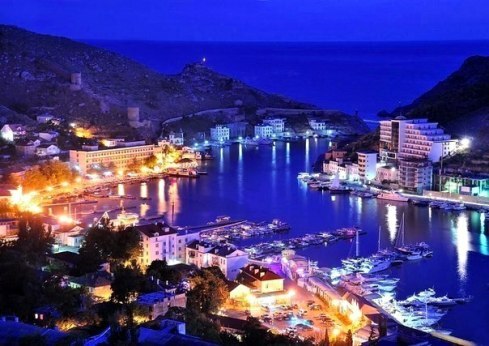 Currently Balaclava is opened to tourists and is a popular resort in the Crimea. Tourists are attracted not only to the city itself, with its mysterious ancient history, but also the surrounding beaches. Of course it is possible to ad more museums etc to extend the tour. We like to help you to accomplice this. Daily, except Mondays and official holidays.